This month is a big month for my friend, Patty Blount. She’s celebrating a birthday, which is something we share in common in the month of November. So I’m here to say “Happy Birthday, Patty!” This is a big one, the Big *mumble, mumble* as they say. Congratulations, Patty! I hope it’s the best! If you haven’t met Patty, allow me to introduce you. Patty is the award-winning author of the young adult novels Send, TMI, Some Boys, and Nothing Left to Burn, as well as a couple of delightful romances. I had the great privilege of reading Send before it was published, and make a point of snapping up her books the second they hit the shelves. They are powerful, poignant, raw, and genuine. I can’t recommend them enough. Now, since it’s her birthday, and such a momentous one, I wanted to get her a little something. Patty has a love of many things. Chocolate is always a good choice, but I wanted to go for something less fleeting. Chocolate is such a “here today, in my mouth—er—today. Hey, what happened to all the chocolate?” kind of thing. (Yes, I ate all the chocolate.) So I decided to go for something a little more permanent. The thing is, how to pick? Shoes are such a personal thing. I mean, superficially they’re just those things that keep you from stubbing your toe, but in practice they are so much more than that. 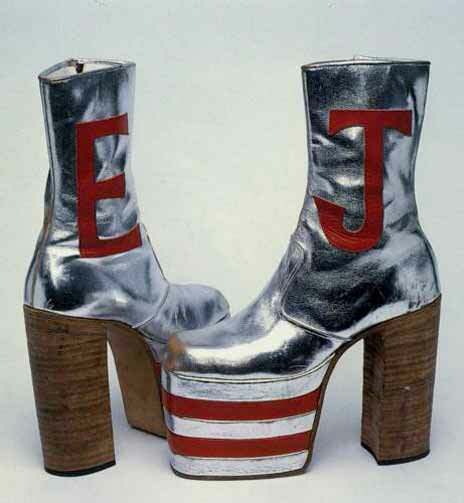 They are a way to express ourselves, to shoe the world our je ne sais quoi. Even people who say they don’t care about shoes probably care about shoes. Shoes can be practical, they can be elegant, they can be daring, they can be playful. Sometimes they’re all of the above. And when it comes to the right shoes for Patty, I’m thinking all of the above is the way to go. 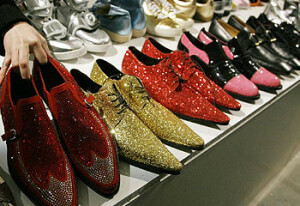 And that means a visit to Elton John’s shoe closet. Which I assume is probably bigger than my entire house. Maybe my entire block. Right off the bat, I found a good choice. Simple, elegant, but with a hint of flare. Who wouldn’t want to wear these babies? But something wasn’t quite right. I mean, these were pretty good, but they were missing something. Hmmm. Then it hit me. They were missing levels. These are MUCH better. Look at these beauties, all the flash of the first pair, only more so. I kinda wish I was getting them for me. Still, it seems like I need something more … Eltony. Metallic platforms are great—don’t get me wrong. But this is a big birthday. I want something Patty can wear with pride and pleasure. Something that says I’m on top of the world. 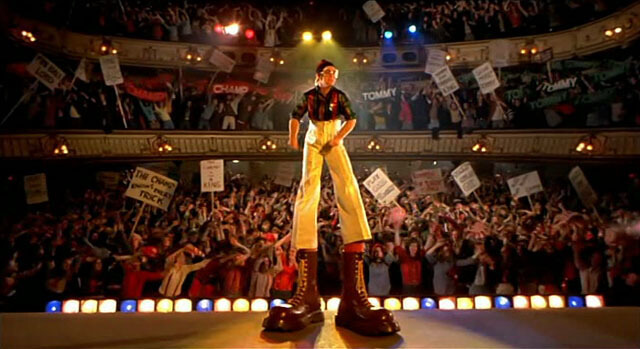 Elton John wore them for his performance as the Pinball Wizard in the eternally weird film adaptation of the The Who’s Tommy. 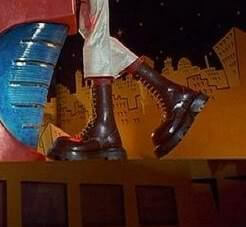 When he agreed to appear in the film, one of his conditions was that he get to keep the boots. Heck, if it was me, that would have been my only request. No need to pay me, just give me the boots. Unfortunately, I was not asked to be the Pinball Wizard, perhaps due to the fact that I was eleven years old at the time and have the singing voice of a dead toad. Still. Who wouldn’t love them? One small problem, Patty. Turns out they’re, uh, not actually available. 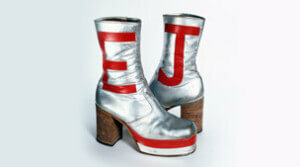 I mean, I tried, but apparently Elton sold them in 1988 and now they’re on display at the Northampton Museum. I called them up and said, “I’m holding my debit card right here in my hand!” Apparently they want to keep them. But here is another picture of them. And here is my sincere hope that your birthday celebration this month is amazing. I’m glad you are my friend.